Geez, even right down to a watch band! Well, why the heck not? 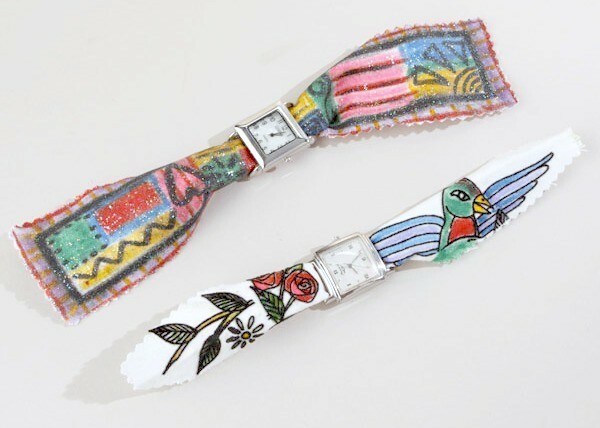 For this project, I used white fabric and embellished it with my Crafty Chica markers and iron-ons and added sturdy hook and loop tape on the ends. You can find interesting watch faces at the thrift store. Sure, we always have our smartphones to check the time, but there is nothing more classic and stylish than an old school watch on your wrist – especially if it sports your artful personality! Cut a piece of canvas measuring 2” x 7”. Cut up the Iron-On Transfer and place pieces randomly on canvas strip – or freehand draw your own design using the black marker. Iron pieces in place, following instructions on package. Color in the Transfers with desired color of markers. 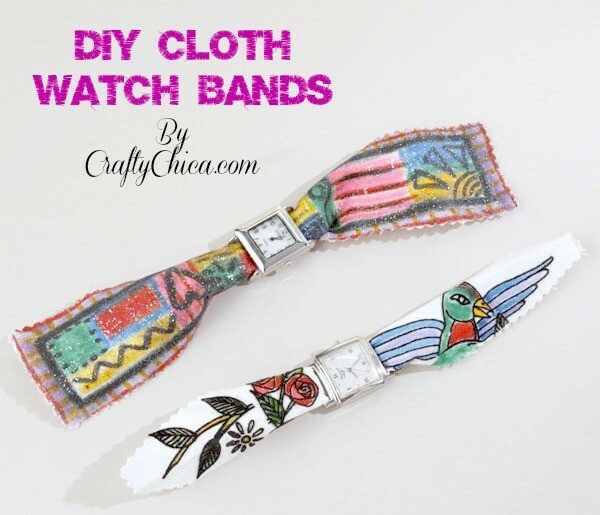 Brush a coat of Collage Pauge Sparkles onto watchband and let dry. Fold in thirds, front side out, and feed through the watch bars. Add hook and loop tape to each end of the watchband. I love this one! I am a watch freak anyway, and this is simply beautiful!